When Hermès announced Eau de Citron Noir I was thrilled. It was (maybe) full of things I love: citrus galore, black tea, guaiac wood. My nose itched for a sniff but, wisely, I didn't just up and buy Eau de Citron Noir before smelling it. It has become my most recent and glaring example of the distance between desire and description — and reality. Eau de Citron Noir goes on sharp and alcohol-y and it takes some seconds before a lemon-lime-mandarin scent comes into focus. Eau de Citron Noir's citrus is on the warm side; this is no effervescing "cool" citrus perfume (the citrus is pretty "flat"). After about five minutes on skin, Eau de Citron Noir provides some herbal notes: sometimes these smell like tarragon to me, at other times there's a hint of sweetest-freshest, bright-green chive (that some may associate with 'sweat'). There's a faint smoke-menthol note that I can smell only if I put nose to skin (this is as close as Eau de Citron Noir gets to "black lime"). At the 20-minute mark on my skin, there's a sea change. A synthetic wood-musk scent comes to the fore and leads to the problematic, and longest lasting, part (for me) of Eau de Citron Noir: its stale-smelling base of exhausted citrus, old moss and cheap wood aromas. This aspect of the fragrance reminded me of tons of other men's "mall" fragrances, many in the sports category. Online perfume commenters have compared Eau de Citron Noir to Bleu de Chanel and Dior Sauvage. To me, Eau de Citron Noir is less complex (and less interesting) than Bleu de Chanel but not so "dire" as god-awful Sauvage. Eau de Citron Noir is an average cologne: sporty and dull. It smells more masculine than feminine to me, and it lasts a LONG time on skin. Hermès Eau de Citron Noir is available in a limited edition 50 ml size ($95), and in 100 ($130) and 200 ml ($175) Eau de Toilette. Great review Kevin – such a shame to hear that it’s a disappointment, as I was eager to try this one too! Incidentally, what are your personal favourites from Hermès? Lizzy: Let’s put it this way: I have 13 Hermes right now…and could have even more! I love Bel Ami, Equipage, many of the jardin fragrances, the colognes…. What a bummer. I had some hopes as I like two of the new hermessences, somewhat to my surprise. But this sounds awful. Thanks for the review! Amy: well, give it a sniff anyway! I still have not tried the five new ones from the Hermessences line. I’m taking “lasts a LONG time on skin” as euphemism for “hard to scrub off.” Amiright? Too bad the blue bottle was wasted on this tepid perfume. Hajusuuri: You’re right…and don’t get it on CLOTHING! Eeeek, now I am skeered. 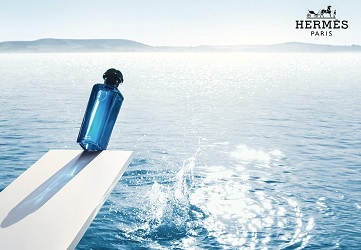 Thank God I have not encountered a spritz-happy Hermes SA! Mrs D: Really? You know it’s Eau de Citron Noir committing suicide, right? Thanks for the review Kevin… sounds interesting but a whiff of it will tell! I’ve got ten Hermes in my collection and could also add a few more. One thing’s for sure… anything they’ve ever released that comes in a blue bottle is never a like for me so I won’t be in a hurry to experience this one! 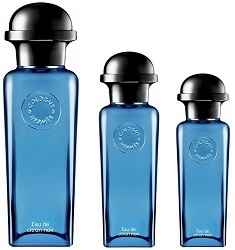 Interesting to note that the past few releases of the Eau line have been in pairs… Narcisse Bleu and Mandarine Ambree then Neroli Dore and Rhubarbe Ecarlate. Love the latter in both cases. I’m also disappointed about this. I love and wear a lot of scents that’s coded “men’s” (hello Gucci Guilty absolute) but it’s was the wrong kind of masculine for me. Persistent and vintage cologne paired with strong musk. It also doesn’t feel modern or timeless like the others in the line. And for reference, I love Rhubarbe, Pamplemousse, Un Jardin Sur Le Nil and all the formulas of Eau de merveille. Anna: this had a “sad” smell…and I never think of Hermes as smelling unhappy! Yay! Another synthetic citrus and rude loud screechy woody amber on the market, how exciting! Bill: …and many more to come, no doubt. I went to smell it just this afternoon. For two minutes it smelled nice enough, very citrus-y. Then it turned into a woody amber mess à la Sauvage. Ugh. Thanks for the review, Kevin. This finally made me dig out my sample (which is one of the very few that I can actually smell from my drawer) and spray it on. I knew that it would probably be more masculine than what I like to wear, but I’ve been looking for a replacement for my husband’s Terre d’Hermes once it’s all used up (lovely scent, just thought it would be fun to mix it up). Anyway. This was a hit with my 10 year old daughter – “this smells way better than all your other perfumes” and a big NO from my 12 year old “Omg. What is this?!”. Myself, I agree with you – it’s kind of loud. And sour, actually reminds me of preserved lemon rind. Eschmeling: Yikes! Don’t let your hubby smell it. HA! If he likes it you may be stuck! Sad but true – it is indeed a Bleu de Chanel clone. And I agree, BdC at least has an interesting facet to it here and there. This one is soooo disappointing. jasonk: I was hoping this would be my new fabulous citrus for hot weather…the search goes on…. Sebastian: well, just give it a sniff just so you know for sure. Spot on, Robin. I already left a rant (comment) at the announcement. If this marks the departure of Ellena, … Well, the big houses don’t only want the money of people with a developed taste in fragrance compositions, I understand that. It’s like Guerlain’s Acque Allegoria that started out as wonderful colognes and today resemble fabric conditioners. But this CN just doesn’t make sense in that series of fleeting eaux de cologne. I think it would have made sense releasing it as a separate men’s fragrance in a new bottle design. I like the opening of this one a lot. It does smell like kumquat to me. The drydown is tarry but muted and quiet on me so I did pay much attention to that aspect? Its been so hot, I have been respraying this to repeat the fabulous opening over and over again. I might wait for this to come out from the discounters. I also like Narcisse Bleu’s opening but wasn’t too crazy about the drydown. But it was at least tolerable (because it’s quiet), unlike the shrill white musk from Atelier Cologne’s offerings.